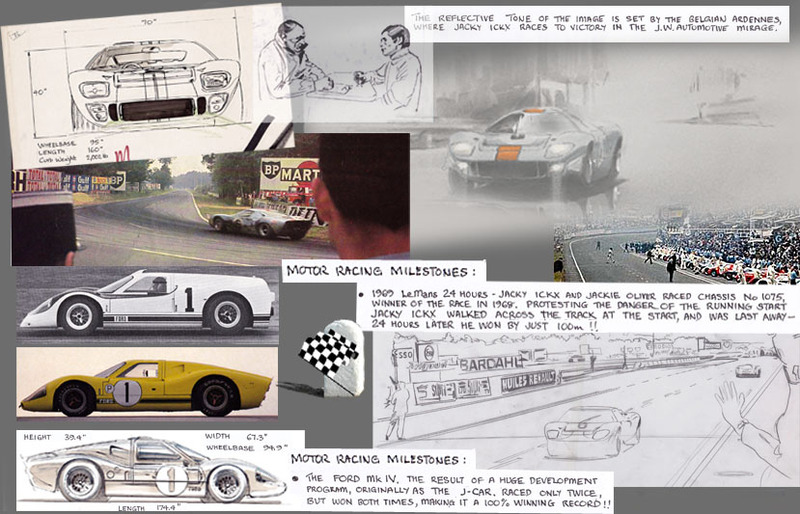 This fabulous art print tells the story of the classic evolution of the Ford GT40, in its many guises from the long nose frst car, through the Mk II, Mk IV, Mirage and finally the Le Mans winning 1075. The reflective tone of the image is set by the Belgian Ardennes, where Jacky Ickx races to victory in the J.W.Automotive Mirage. Motor Racing Milestones: In 1969 Le Mans 24 hours Jacky Ickx and Jackie Oliver raced chassis 1075, the winner from 1968. Protesting the danger of the running start Jacky Ickx walked across the track at the start and was last away – 24 hours later he won – by just 100m. Motor Racing Milestones: the Ford MkIV, the result of a huge development programme, originally as the J-Car, raced only twice Sebring 12 hours 1967 and Le Mans 24hours 1967. It won both races and so had a 100% winning record!